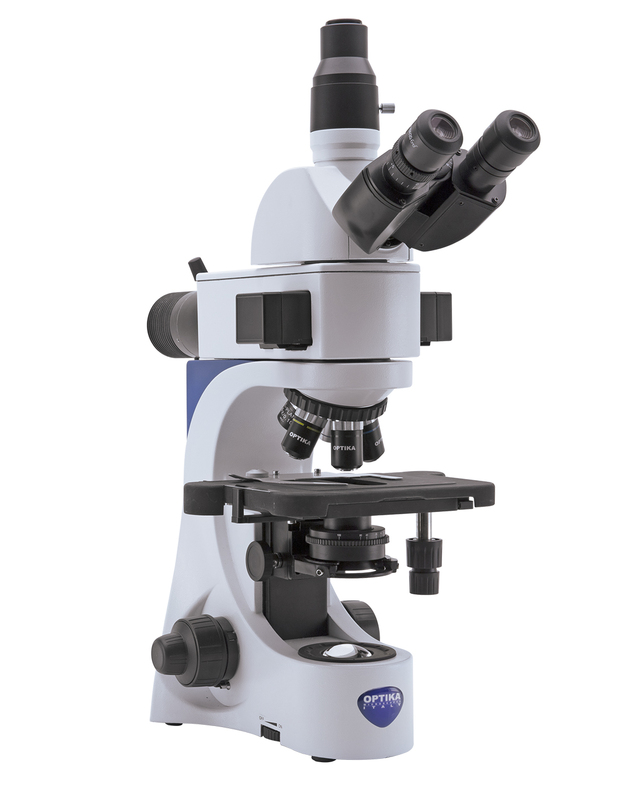 A fluorescence microscope is an optical microscope that uses fluorescence and phosphorescence instead of, or in addition to, reflection and absorption to study properties of organic or inorganic substances. 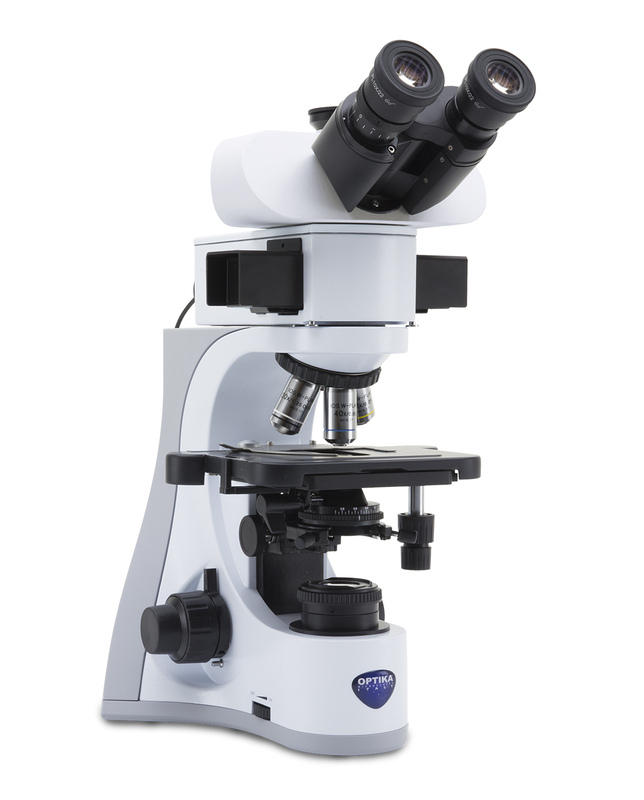 The “fluorescence microscope” refers to any microscope that uses fluorescence to generate an image. The Epi Fluorescence microscope is equipped with a fluorescence illuminator wich generates incident fluorescence light.highlight points of interest. The specimen is illuminated with light of a specific wavelength (or wavelengths) which is absorbed by the fluorophores, causing them to emit light of longer wavelengths (i.e., of a different color than the absorbed light). The illumination light is separated from the much weaker emitted fluorescence through the use of a spectral emission filter. 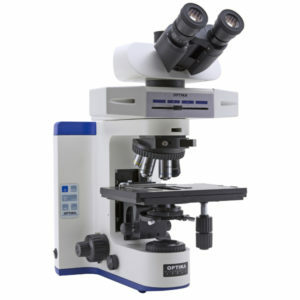 Typical components of a fluorescence microscope are a light source (HBO mercury-vapor lamps are common; more advanced forms are high-power LEDs), the excitation filter, the dichroic mirror, and the emission filter. The filters and the dichroic mirror are chosen to match the spectral excitation and emission characteristics of the fluorophore used to label the specimen. In this manner, the distribution of a single fluorophore (color) is imaged at a time. Multi-color images of several types of fluorophores must be composed by combining several single-color images. 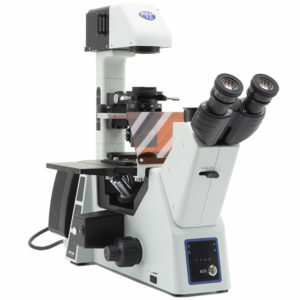 Most fluorescence microscopes in use are epifluorescence microscopes, where excitation of the fluorophore and detection of the fluorescence are done through the same light path (through the objective). 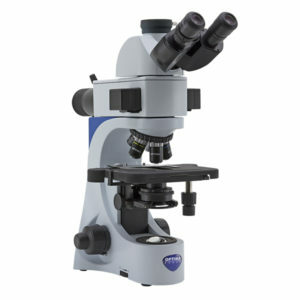 These microscopes are widely used in biology and are the basis for more advanced microscope designs. 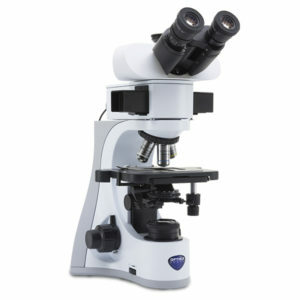 The majority of fluorescence microscopes, especially those used in the life sciences, are of the epifluorescence design. Light of the excitation wavelength illuminates the specimen through the objective lens. 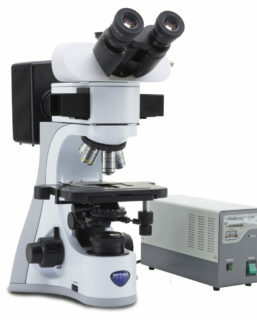 The fluorescence emitted by the specimen is focused to the detector by the same objective that is used for the excitation which for greater resolution will need objective lens with higher numerical aperture. 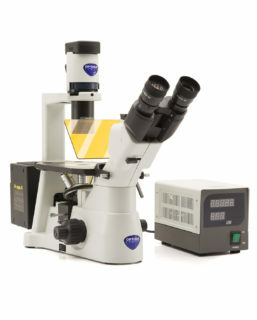 Since most of the excitation light is transmitted through the specimen, only reflected excitatory light reaches the objective together with the emitted light and the epifluorescence method therefore gives a high signal-to-noise ratio. The dichroic beamsplitter acts as a wavelength specific filter, transmitting fluoresced light through to the eyepiece or detector, but reflecting any remaining excitation light back towards the source. The fluorescence microscopy is the most demanding technique in biology and the biomedical sciences, as well as in materials science. 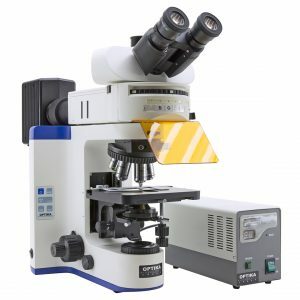 This method is capable to study organic and inorganic samples thanks to primary fluorescence (auto-fluorescence) or secondary (staining and labelling with fluorochromes). 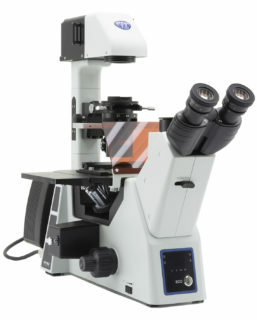 The B-383LD1 LED fluorescent microscope is a cutting-edge solution designed to enable rapid diagnosis of malaria and TBC, by using acridine-orange staining technique. The optional no cover glass W-PLAN 50x/0.75 objective is required to ensure excellent results for stunning images. The aim is to reduce the costs to a minimum and provide a cost-effective, intuitive but performing solution, purposely designed for these applications. In fact, brightfield, phase contrast, darkfield and fluorescence techniques can be used at any time, to highlight different aspects of your specimen. 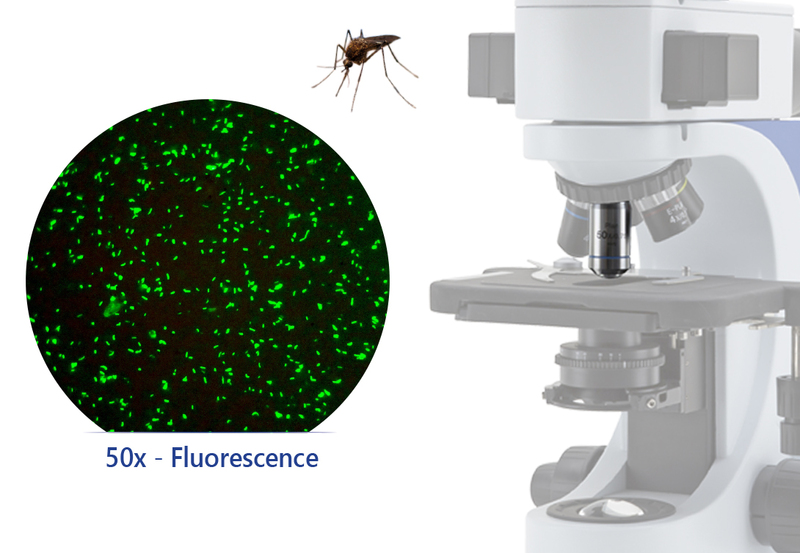 Using LED fluorescence has never been so easy! With IM-5FLD, you will simply choose which filter is needed (among blue, green and UV) and then the microscope will select the most suitable lighting source for you, automatically. In addition, an extra slot is available for the most demanding users, with the possibility to create a customized configuration. Fluorescence binocular microscopes especially designed for tubercolosis and malaria analysis with IOS W-PLAN MET 50x/0.75 (No Cover), with anti-fungus treatment. Fluorescence trinocular microscopes especially designed for tubercolosis and malaria analysis with IOS W-PLAN MET 50x/0.75 (No Cover), with anti-fungus treatment. 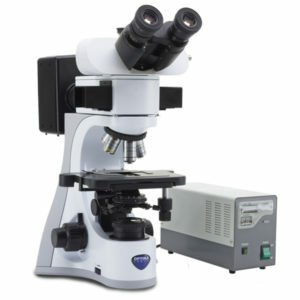 Fluorescence binocular microscopes especially designed for tubercolosis and malaria analysis IOS W-PLAN 100x/0.80 (No Cover, Dry), with anti-fungus treatment. 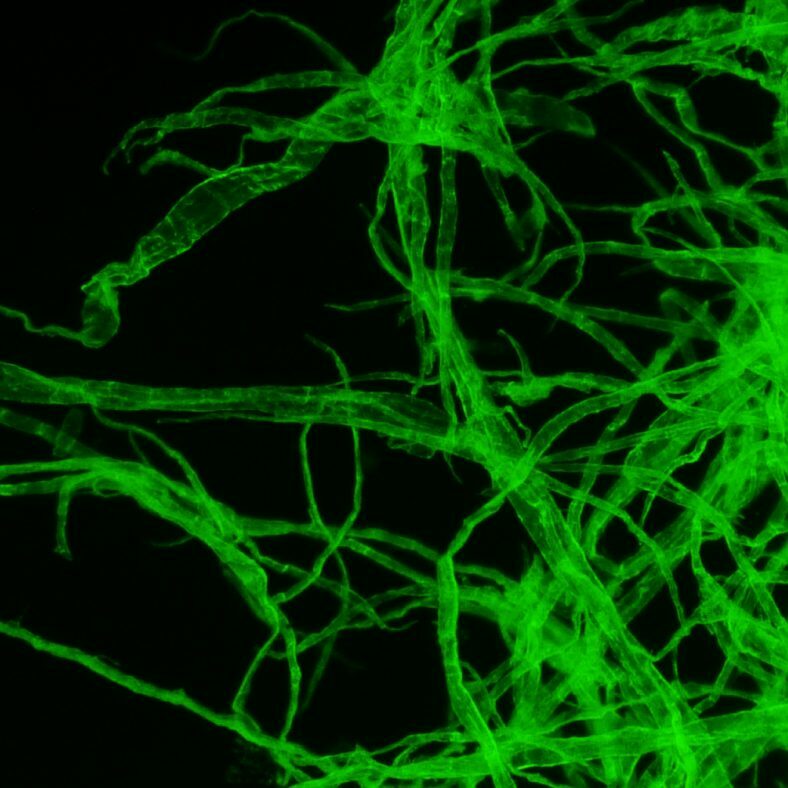 Advanced routine fluorescence microscope for transmitted brightfield and fluorescence observations with IOS W-PLAN objectives. The extremely powerful LED fluorescence illuminator is combined with blue excitation filter set for the visualization of the following fluorochromes: Acridine Yellow, Acridine Orange, Auramine, DiO, DTAF, FITC, GFP, YFP, etc. LED fluorescence ensures unparalleled convenience eliminating warm-up/cool-down times and all the inconveniences related lamp replacement and adjustment. 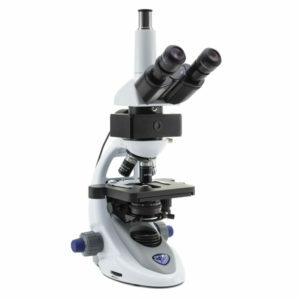 Transmitted light through the exclusive X-LED3 to ensure great-looking, rich and high-quality specimen view. The extremely powerful LED fluorescence illuminator is combined with blue and green excitation filter set for the visualization of the following fluorochromes: Acridine Yellow, Acridine Orange, Auramine, DiO, DTAF, FITC, GFP, YFP, etc. (blue) plus Rhodamine, Texas Red and TRITC (green). LED fluorescence ensures unparalleled convenience eliminating warm-up/cool-down times and all the inconveniences related lamp replacement and adjustment. Transmitted light through the exclusive X-LED3 to ensure great-looking, rich and high-quality specimen view. 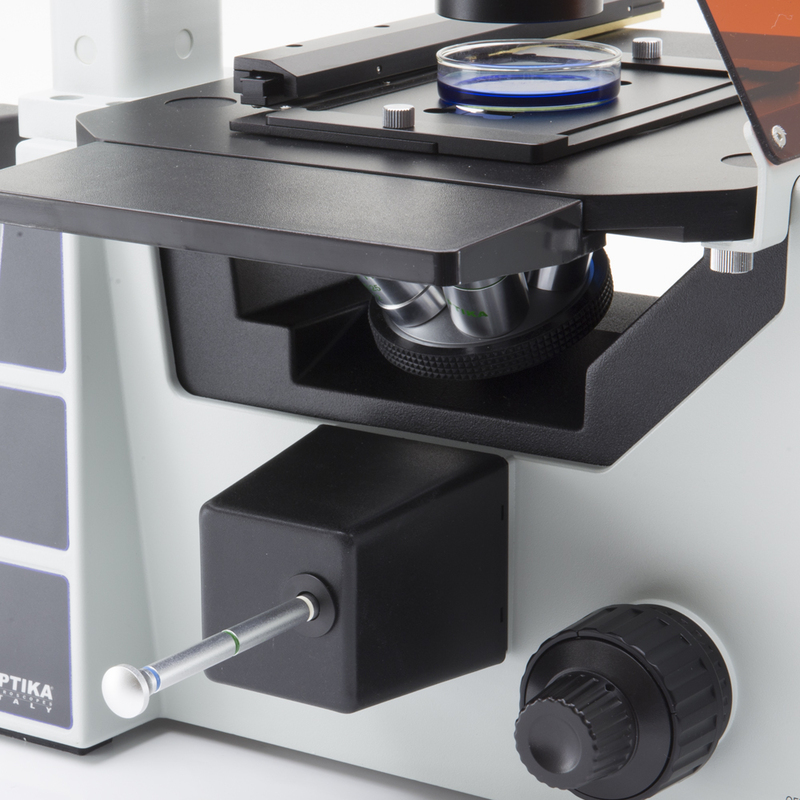 The modular OPTIKA B-1000 can stand a LED fluorescence attachment, helping you working in a comfortable way during extended periods of use and performing reliable, accurate and rapid diagnosis benefiting from modularity, which gives the chance to create customized configurations tailored on customer needs. 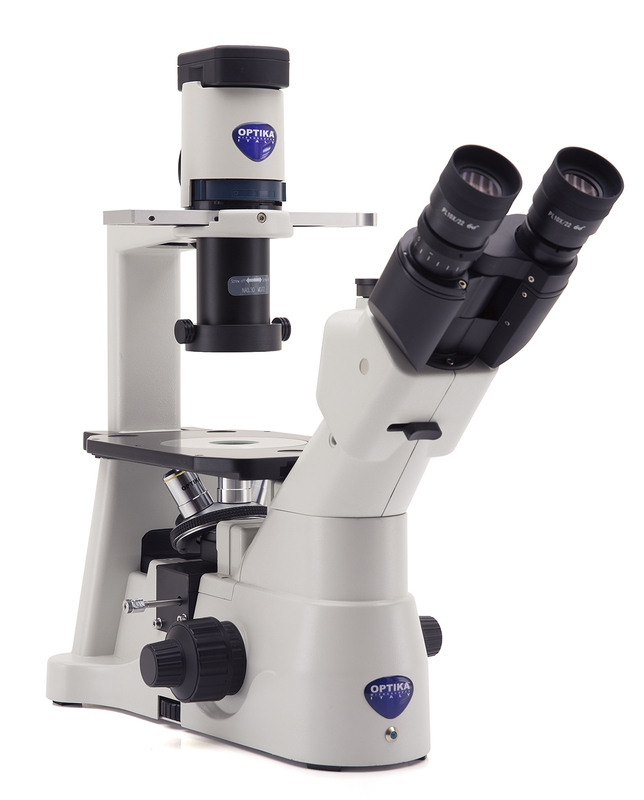 Versatile, robust, durable and sturdy, B-1000 offers premium quality optics (including Semi-Apo objectives), the state-of-the-art, exclusive X-LED8 (8 W) illumination system, designed by OPTIKA and the Koehler diaphragm. B-1000 gives multiple options as manual or motorized configuration, with a variety of objectives, stages and condensers. 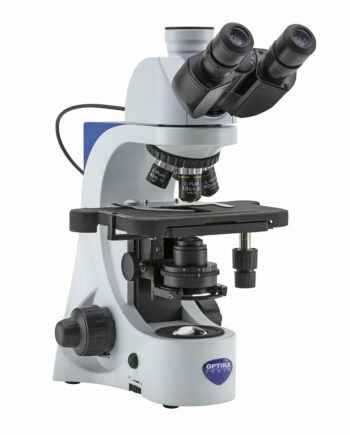 The modular OPTIKA B-1000 can stand a HBO fluorescence attachment, helping you working in a comfortable way during extended periods of use and performing reliable, accurate and rapid diagnosis benefiting from modularity, which gives the chance to create customized configurations tailored on customer needs. Versatile, robust, durable and sturdy, B-1000 offers premium quality optics (including Semi-Apo objectives), the state-of-the-art, exclusive X-LED8 (8 W) illumination system, designed by OPTIKA and the Koehler diaphragm. B-1000 gives multiple options as manual or motorized configuration, with a variety of objectives, stages and condensers. Routine inverted fluorescence microscope for transmitted brightfield, phase contrast and fluorescence observations with IOS LWD W-PLAN PH objectives. 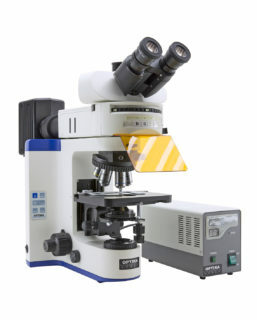 The LED fluorescence illuminator is combined with blue and green excitation filter set for the visualization of the following fluorochromes: Acridine Yellow, Acridine Orange, Auramine, DiO, DTAF, FITC, GFP, YFP, etc. (blue) plus Rhodamine, Texas Red and TRITC (green). LED fluorescence ensures unparalleled convenience eliminating warm-up/cool-down times and all the inconveniences related lamp replacement and adjustment. 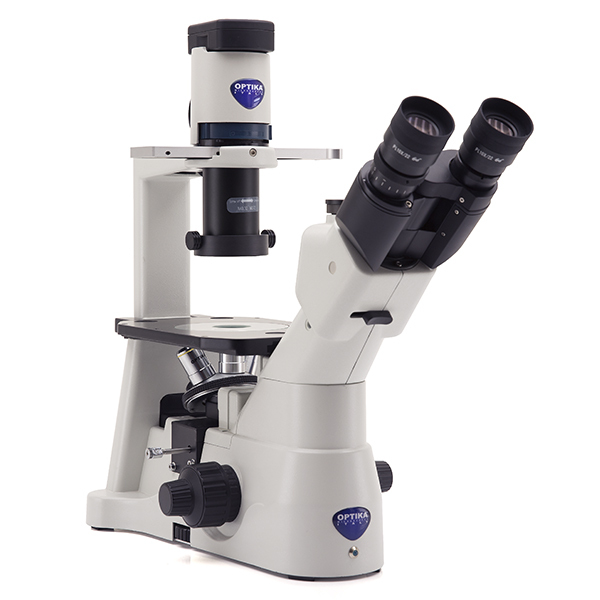 Transmitted light through the exclusive X-LED8 to ensure great-looking, rich and high-quality specimen view. 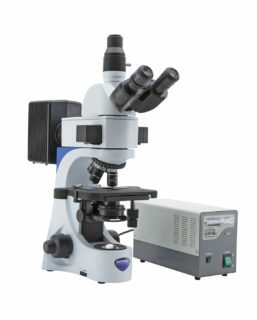 Routine inverted fluorescence microscope for transmitted brightfield, phase contrast and fluorescence observations with IOS LWD W-PLAN objectives. The HBO fluorescence illuminator is combined with blue and green excitation filter set for the visualization of the following fluorochromes: Acridine Yellow, Acridine Orange, Auramine, DiO, DTAF, FITC, GFP, YFP, etc. 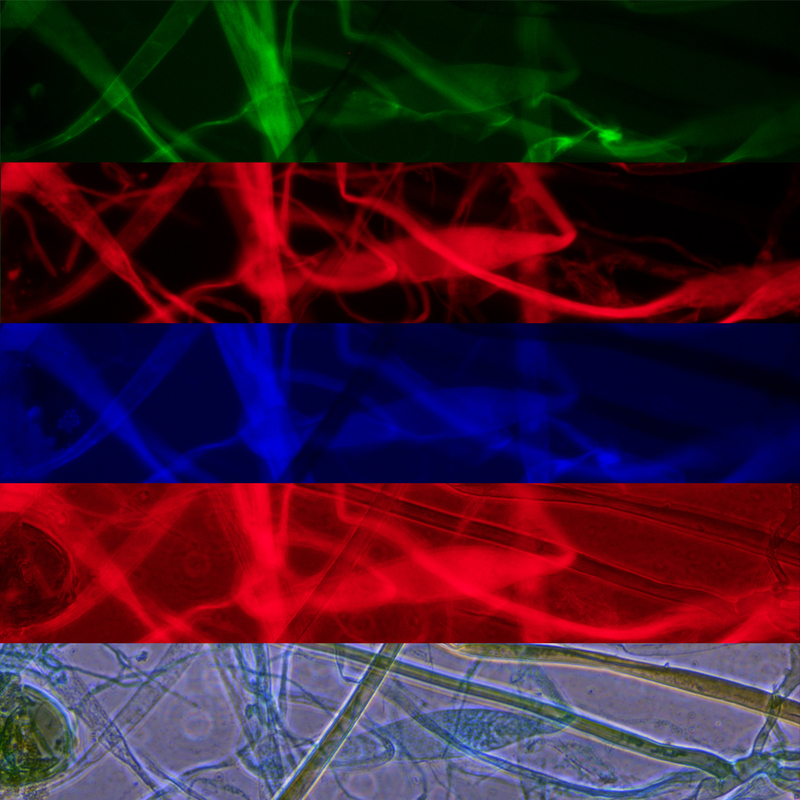 (blue) plus Rhodamine, Texas Red and TRITC (green). 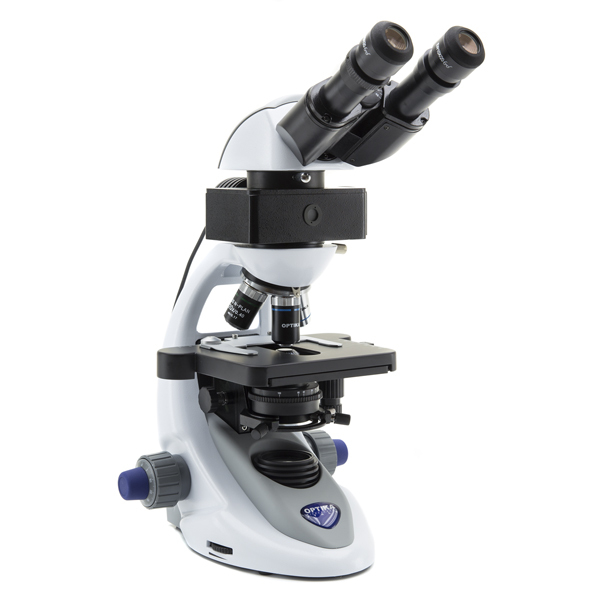 Transmitted light through the exclusive X-LED8 to ensure great-looking, rich and high-quality specimen view. 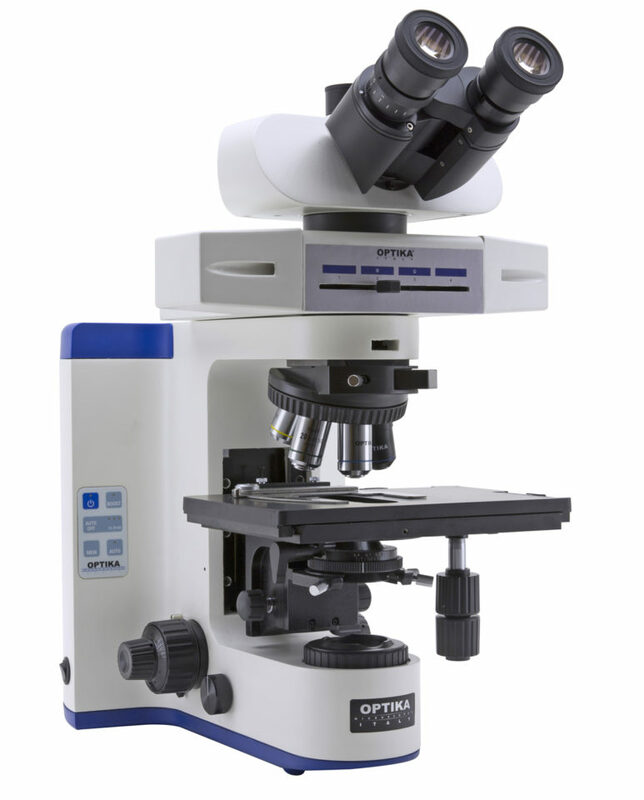 OPTIKA IM-5FLD is designed to be the ultimate inverted research fluorescence microscope, combining innovative technology with unparalleled comfort. You can achieve astonishing images thanks to the IM-5FLD superb optics, Köhler condenser and the pioneering motorized selection of the more suitable LED source, automatically chosen in accordance with the selected fluorescence filter set (B, G, UV, plus optional ones). Last but not least, IM-5FLD boasts the highest F.O.V. available on an inverted microscope. Transmitted light through the exclusive X-LED8 to ensure great-looking, rich and high-quality specimen view.